Earlier this month, Carl Froch retained his WBC super middleweight title over 42 year-old Glen Johnson by majority decision at Atlantic City’s Boardwalk Hall. DiBella Entertainment and Warriors along with Showtime presented the 6-bout card. The crowd was anticipating a good match-up in the main event after watching 5 non-competitive bouts with the last one so dreadful the network aired Mikkel Kessler stopping Mehdi Bouadler which had been fought earlier from Denmark since Kessler has been part of the tournament defeating Froch but losing to Andre Ward. It was as though the network told Edison Miranda to go the distance after almost stopping Rayco Saunders in the first 2 rounds in order to fill the gap. The greater majority of the fans were pulling for Johnson to score a knockout. He certainly wasn’t going to outscore the busier Froch. He rocked the champion in the sixth, seventh and tenth rounds. To Froch’s credit he came right back each time with a flurry. It was this writer’s first time viewing Froch and with his amateurish style it will only be nice to see Ward capture his title. Froch is what today’s Olympic boxing is all about. Froch has no right uppercut and to think he has gone through 28 fights without being countered and knocked out speaks well of his chin. He didn’t want to get into a slugging contest with Johnson who chased him from start to finish trying to land one overhand right to end it. He ate Froch’s jabs throughout. This writer had it 118-110 for Froch. The judges were a little more generous toward Johnson especially Nobuski Urtain of Japan who somehow came up with a 114-114 draw. There’s no chance this judge will do the Froch-Ward fight. The other 2 judges were Mark Green of the UK who had it 116-112 and John Stewart of the US who had it 117-111. The sport’s top ring announcer Jimmy Lennon, Jr. shocked the fans when he announced it was a majority draw. The “Road Warrior” cannot fight runners and has to realize his days are numbered as an active boxer. He has now lost 3 of his last 5 fights. He is very popular and very respectful toward his opponents and the press. Froch on the other hand is in for a thrashing by WBA Super Middleweight champion Andre Ward who has a much quicker and effective jab. Ward was working with Showtime at ringside and has to be looking forward to meeting Froch to add the WBC belt to his WBA belt. When not on the air Ward was sitting next to his lovely wife Tiffiney. Ward has set an example for boxers for all to live by in and out of the ring. 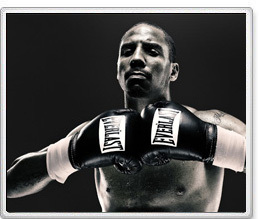 If every promoter had to deal with an Andre Ward there would be no room for corruptness. It would certainly help lean up the sport. As an Olympic Gold medalist for team USA he has honored his country and has since been unbeaten in 24 fights, 13 by way of knockout. It seems this tournament has been going on much too long for anyone to be clear on its ending. Since Kessler defeated Froch and has only lost to Ward in November of 2009, he may still be in this since it’s double elimination. Or at the least get first shot at the Ward-Froch winner.